The Underground Museum (The UM) presents Water & Power, the fourth exhibition curated by its founder, the late painter and installation artist Noah Davis. The exhibition features work by artists Olafur Eliasson, Hans Haacke, and James Turrell from the permanent collection of The Museum of Contemporary Art, Los Angeles (MOCA), along with Los Angeles based artist Fred Eversley and Los Angeles’ Poet Laureate, Robin Coste-Lewis. The show is both historical and global in its scope. 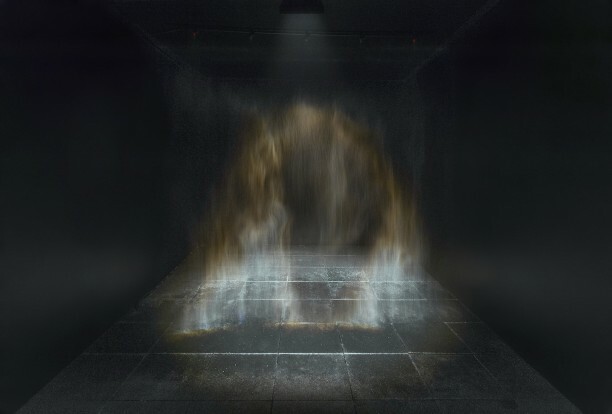 It includes some of the earliest works by Eliasson, Haacke, and Turrell, when they were just beginning their exploration of natural phenomena as sculptural material: elusive rainbows, ceaseless condensation and minimalist architecture are rendered from light, liquid, and atmosphere. Each artist makes present ecological systems that we humans are intrinsically a part of. A parabolic lens by LA-based Light & Space pioneer, Eversley, demonstrates how energy guides form, and Coste-Lewis’s poem maps geographies of people through her project on the indigenous circumpolar diaspora, Arctic colonialism/exploration, and Matthew Henson. Water & Power offers an opportunity for engaging community on the topic of our shared environment. The exhibition’s title alludes to the ways that natural resources are distributed (and withheld) along social, racial and class lines. The UM is located in a predominantly Black and Latino, working-class neighborhood—demographics too often left out of climate change discussions. Our signature free public programs will bring artists, writers, futurists, and scientists together in conversation on ecology and political systems. The show is fertile ground (pun intended) to discuss strategies for building environmental equity throughout South LA, increasing local green spaces, and sustainability practices. Please check theunderground-museum.org/calendar for updates on exhibition programs. Event details are also available on The UM’s Instagram feed (follow @theundergroundmuseum). Water & Power is made possible by generous grants from The Aileen Getty Foundation and the Ford Foundation. Special thanks to Robin Coste-Lewis, Fred Eversley, and Maria Larsson. Exhibition design by Commonwealth Projects.